Young Xehanort's Keyblade is a Keychain for Master Xehanort's Keyblade, appearing in Kingdom Hearts 3D: Dream Drop Distance and Kingdom Hearts III. After Mickey Mouse casts a Stopza spell to aid Riku in rescuing Sora from Xehanort's Organization XIII, Master Xehanort's consciousness overrides the spell by possessing and temporarily granting Young Xehanort the ability to wield his Keyblade, though he does so with this specific Keychain. Riku, however, defeats him and sends him retreating. Young Xehanort's Keyblade mixes design elements of both Xehanort's and Terra, Ventus, and Aqua's No Names. 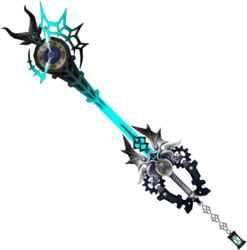 This Keyblade significantly resembles Terra, Ventus, and Aqua's No Name, in that it is predominantly colored in different shades of blue and is decorated with elaborate, spiked shapes. The tip is modeled after a stopwatch, while the teeth are diamond-shaped spikes that are connected by a black web structure similar to the design on the base of the top spire of Memory's Skyscraper. The Keychain shares the time theme represented in the blade, with an hourglass as its token. Its shaft resembles Young Xehanort's Ethereal Blades, as does the blade with its neon like glow. The Keyblade also includes attributes from Master Xehanort's No Name, such as the demonic wings at the beginning of the shaft, the horned lion[please confirm] head at the tip similar to the goat head on the other Keyblade, and the Gazing Eye. Artwork from the Kingdom Hearts 3D: Dream Drop Distance Ultimania. This page was last edited on 22 April 2019, at 02:07.